Conveniently swamp-adjacent, the small town is a handy place for fleeing convicts to hide from the local police. Not that hiding from the not-over-blessed-with-observational-powers cops is particularly difficult. The detective and his naive sidekick might be a greater challenge to the town’s omerta, but the detective is not in town to look for escaped prisoners. He is in town to look for a young girl who vanished shortly after she and her mother moved to town, enticed by the surprisingly affordable rents. While most of the locals are a close-mouthed lot, Kevin is an exception. Kevin is perfectly happy to share what he knows with the detective. Ex Ignorantia Ad Sapientiam; Ex Luce Ad Tenebras…. The Theatre of the Arts is a surprisingly spacious facility located in the Modern Languages Building 2. It may not be obvious from that photo, but the venue seats about 400 people. Because of the design of the theatre, it’s a good venue if your show benefits from interacting with the audience 3. I am very fond of TofA as a performing space. It’s also a perfect place to stage a horror show because it’s easy to mop up pools of blood in TofA 4. What it does not particularly seem designed to do is facilitate the recording of performances and I think the video suffers for that reason. If it’s any comfort to UW Cabaret, I know of another amateur musical company on campus whose early videos in the same venue came out sans image. Unless it was sans sound. Or both. It’s been a few decades and the memories fade. Something I discovered in the course of my spec-fic-radio-play listening extravaganza is that there is a Canadian horror genre. The recurring features are small towns, newcomers or visitors, dark secrets and horrific revelations; terrible weather is optional. I don’t know what it is about road trips and small towns that inspires so many Canadian writers to feature them in horror stories. If I had to guess, I’d blame terrible family holidays. 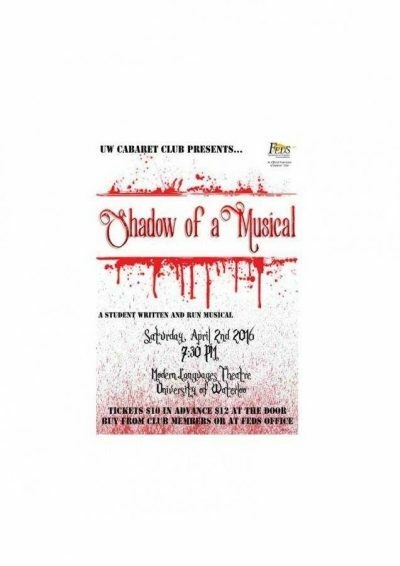 Shadow of a Musical falls firmly within that genre. It’s is also an example of amateur musical theatre and should be judged accordingly. Student am-drams sometimes feature people who are just discovering theatre and dance and whose performances may demonstrate more enthusiasm than skill. Consider them the seeds from which crops of future professionals may bloom. I will say, having helped inflict over-long shows on long-suffering UW audiences myself, that Kohli has a pretty good ear for how long a musical should be. An hour and a half is about right. Much less and it is too short. Too long and eyes glaze over. Two such shows back to back … the horror, the horror! If you were wondering how it is that a Lovecraftian horror story has scantily clad convicts flirting with cops and performing production numbers while hiding in plain sight, that would be the musical comedy side of things. It’s funnier if the authority figures are very slow on the uptake. The modestly revealing costumes reflect humanity’s struggle with the existential horror of an infinite universe and our very finite selves. Wait. No, that part is a musical trope too. Basically, don’t get too wedded to logic in musicals unless by logic you mean “At the end of this dialogue, everyone still on stage is going to begin to sing and dance 5 and we’re all going to treat that as perfectly normal behaviour.” And why should that be any more extraordinary that “also, we’re going to sacrifice some people in a bid to stave off our inevitable doom, like that ever works”? Presumably the program listed the technical credits. I let a little thing like a blizzard keep me from seeing the show in meatspace, so I don’t know who to credit. UW Cabaret Club was founded in 2011. This is the first UW Cabaret Production I have experienced. It won’t be the last. And the next one will be in person. 1: All hail SOCAN licences, long may treasurers remember to actually pay them. 2: How many performance spaces would a university mainly known for its science and engineering have, you ask? A surprising number: in addition to the majestic Humanities Theatre, there are also the Theatre of the Arts, Studio 180, and the CCAT Studio, as well as many other facilities that can be adapted as performance spaces, with or without the knowledge of the university. More details here and here. 3: At Humanities Theatre (the largest stage on campus), the drop from the front of the stage is anywhere from a few feet (if the lift is up) or about a story (if the lift is down). While there are stairs, the ushers will likely react with alarm if it looks like an actor or group of actors is about to take an unscheduled excursion off the front of the stage. 4: Tall actor. Short door. 5: Editor’s note: I remember with some fondness an otherwise forgettable South Indian movie in which the cops are chasing the bad guys. They stop, do an ensemble song and dance number, and then return to the chase. The wonders of Indian cinema!